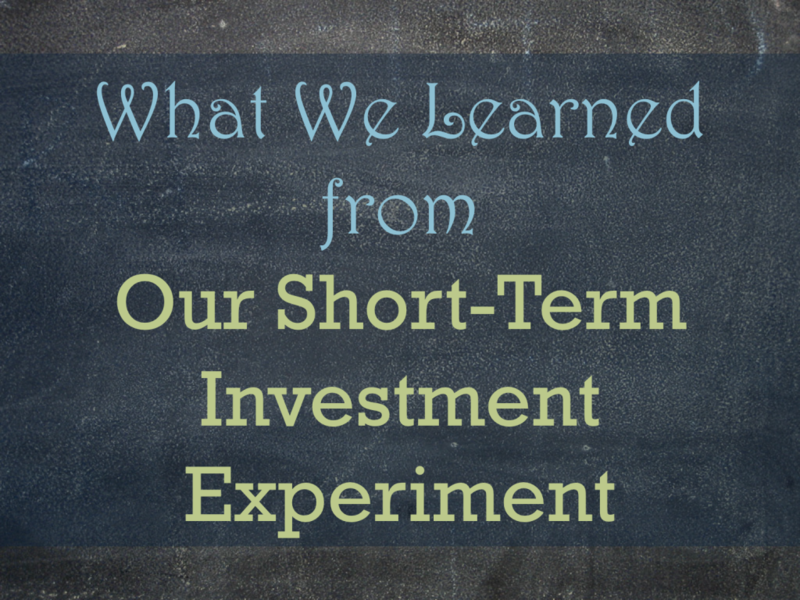 Three and a half years ago, Kyle and I embarked on an investing experiment. When we got married (4.5 years ago) and consolidated our finances, we had enough money to pay off my outstanding student loans of $16,000. However, as the loans were subsidized and deferred while I was in graduate school, we decided to invest the payoff money. Our anticipated timeline was 2-3 years. We wanted to earn a bit of a return, yes, but this experiment was really to test us. How would we fare with non-retirement investments? Would we be able to stomach volatility? Would we be able to pick decent funds? Before I tell you what we learned from our short-term investments, I’ll address our general investment philosophy. It’s pretty simple! We are passive investors. We don’t try to beat the average market returns by picking individual investments or timing the market. (In fact, until the conclusion of this current investing experiment, we had never sold any (non-cash) investments.) At the fund level, passive investments beat active investments (against the same benchmarks) 80% of the time. I figure that if I’m going to try to consistently beat passive investment strategies (which even the professionals obviously have a lot of trouble doing so I’m not confident as I can), it’s going to be at least a part-time job. At that point I’d rather just use a simple, close to zero-time needed passive strategy. We automatically diversify by using mutual funds/index funds/ETFs, which means we are buying large numbers of individual investments even with small amounts of money. We try to use an appropriate asset allocation that is a balance between diversity and high returns. I have a pretty high risk tolerance and Kyle’s is moderate-high. For our retirement savings, we can be quite aggressive as we have a long time horizon. We dollar-cost average, mostly because we don’t usually have lump sums to invest – we just buy on a regular basis. This also helps us to not try to time the market. All other things being equal, we want to buy low-cost investments to maximize our returns over the long term. Our strategy is much better articulated for our long-term retirement investments than our mid-term student loan payoff investments. We conducted this mid-term investing experiment to learn more about investing and our personal dispositions toward it. Even though our mid-term investments involve much less money than our retirement investments, because of how it was invested (in a few funds we chose individually rather than our single retirement mutual fund) we paid a bit more attention to how the different investments performed and learned a few lessons about investing and ourselves. Some of them will apply to you and some won’t, but I hope you will learn something or a point will get you thinking! A year passed from when Kyle and I identified money that we wanted to invest and when we actually invested it. That was silly and unnecessary. We missed out on a year of gains for no good reason. (Of course, sometimes a delay will mean you miss out on market losses, but not most of the time.) Once we really started trying, we only took a few weeks of sporadic hours of research to come up with a plan. It still wasn’t perfect, but it was something! We like to do a lot of research and are disposed to inaction, so with future investment decisions we need to be careful not to waste time. 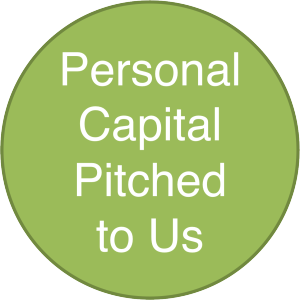 We didn’t know much about capital gains taxes before we made this investment. We were mostly focused on the Roth vs. traditional debate. Tax-sheltered accounts are supposed to be better than taxable because you are taxed every year on the gains, which is essentially a drag on your rate of return. However, depending on your marginal tax bracket and the types of investments you hold, you might be taxed at quite a low rate. Because we are in the 15% marginal tax bracket, our long-term capital gains and qualified dividends (the great majority of our investment returns) tax rate is 0%. All of the funds we bought are diversified within themselves, and but some represented more narrow market segments – an index fund following a sub-asset class, for example. One of those narrowly defined funds took us on a wild ride over the past three years. It was the only fund that showed a net loss over a long period, but in addition it was just super volatile. We mostly noticed this one when it was tanking. We were very glad that we hadn’t put all of our money in this one aggressive fund but rather had a more appropriate asset allocation. While the general principle we hold is to pay as little in fees as possible, sometimes you can’t get what you want without paying some fees. We ended up buying a socially responsible investment and paying higher fees than was typical for us, but we couldn’t find that particular investment in a lower-cost version. We accepted the fee so that we could get exactly the investment we wanted. While we had debt at 0%, it was an easy choice to put our money at risk to try to get a return. We accepted the possibility that we could lose money on the experiment. We have decided to continue investing while leveraging 1.73% debt, which was a harder decision but has the same principle. Even a moderate investing strategy is likely to give us a higher rate of return. We have been fortunate that in the last three and a half years there has not been a big, sustained drop in the stock market. In that way, we have not been truly tested in a bear market. However, there have been period of large volatility and a lot of naysayers discussing market corrections and so forth. We were successful in staying invested through these periods (not changing our investments at all). However, rebalancing was not in our original plan for this money, so we did not test ourselves in sticking to that kind of plan. I understand it is supposed to be emotionally difficult to sell winners and buy losers. This lesson is our ego check. Our investments did well, but so did everyone’s right? Of course we feel confident about this whole endeavor because the market has continued to rise throughout the whole investment period. It won’t always be like that. Looking back, it was kind of crazy that we invested the student loan payoff money. In 2010, our entire net worth was our retirement savings and this money. We should have had, you know, an emergency fund instead of making this investment. Now we are in a much better position with lots of cash on hand, and we really can afford to lose this money if it comes down to it. Therefore, we can be fairly aggressive with it, if we want to. In the next post in this series I will tell you what funds we have been invested in during this experiment and how they performed over the time we owned them. I’ve never explicitly revealed that before! It’s not a recommendation. 😉 In a few more posts, I’ll tell you what new funds we’re buying for the next iteration of these experiments. What investment lessons have you learned? How do you prevent yourself from making emotional investing decisions? Are you making any changes in your investments in 2015? 6 Responses to "What We Learned from Our Short-Term Investment Experiment"
I agree with you Emily that sometimes paying higher can get what we wanted. But, before doing it, we have to assure that we’re not missing out anything or even a minor detail. You know no one wants to lose some money. What I mostly learn in investment is to plan everything out or doing an assignment. I study and research before I move. Happy Holidays Emily! Yes, I agree. I’m not talking about paying huge fees, though – still below ‘typical’ – just more than we are accustomed to. If anything we take too much time to research and need to act faster! At the 0% marginal LTCG brackets, there’s also the notion of capital gains harvesting – if you have a long term gain, you can sell it and buy it back the next day, raising the cost basis for free (so that you’ll have a lower capital gains when you eventually sell it in the future). Unfortunately, you still generally owe state income tax on such capital gains harvesting, so it may not be worth it – it all depends on your investment horizon, expected return of the fund, and predicted LTCG tax rates in the future. Certainly if you were living in a no income tax state, this would be highly effective (unless, of course, you purchased health insurance from the marketplace, and then it increases your income and decreases your subsidy). We were planning to harvest our capital gains in 2014 but didn’t get to it. Hopefully (?) we’ll still be in the 15% tax bracket in 2015. We aren’t going to buy the same investments exactly so the turnover needs to happen at some point.